Chocolate cake and I have a long history. My birthday happens to fall near the holidays. In fact, it’s so close to the festivities that by the time the big day comes around everyone is exhausted from all the eating and jolly-making. Myself included. It can be challenging for everyone to pull themselves together for one last celebration of the year. As a child, there weren’t many traditional birthday parties but there was always cake. That was all that was needed. It was the same cake every year: Chocolate Cake with Chocolate Frosting. Even then chocolate reined supreme in my life. Is it strange that the most memorable parts were eating the cake? One year was extra special as it included a chocolate cake shaped like Garfield the cat. Eating into that orange tabby cat was the highlight of my year. Now, I’m all grown up and it’s still chocolate that marks the day. Except for one thing. I don’t like making cakes. Love eating cake. Don’t like making cake. It’s a predicament. There’s only one kind that can make me pull out those round baking pans without being disgruntled. 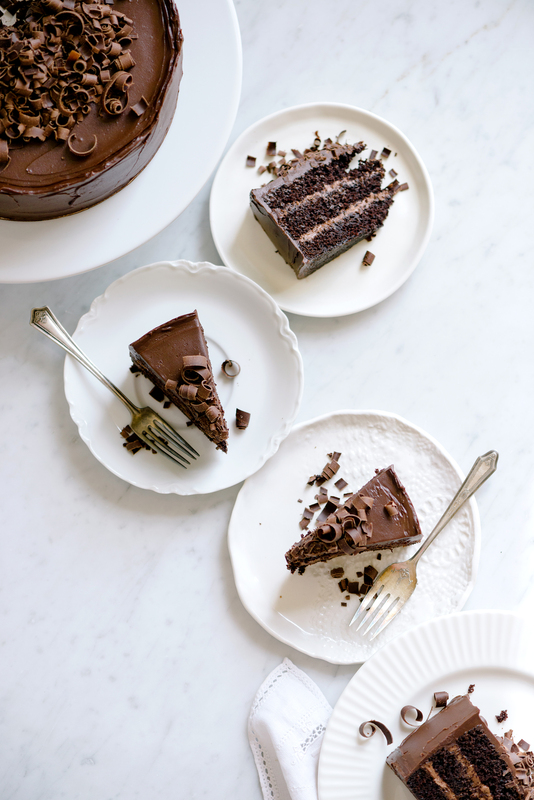 This classic Chocolate Cake with Whipped Dark Chocolate Ganache. It has a luscious thin coating of dark chocolate ganache which seals it all in and keeps it extremely moist. 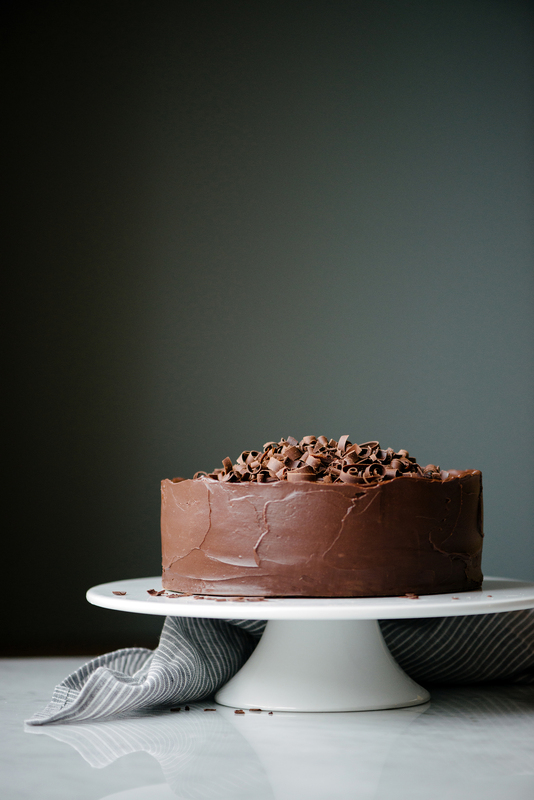 A more “grown-up” and sophisticated version of chocolate cake with chocolate frosting. The best part is how simple the components are to this cake. Since it’s mainly comprised of chocolate, try using the best chocolate that can be found. Simplicity really shines when the quality of ingredients used are at their best. Valrhona chocolate is a personal favorite of mine. It’s the finest French chocolate, but it can be difficult to source and a little pricey. Guittard is a great American family-owned chocolate company, based out of San Francisco. Callebaut is a Swiss chocolate that is also a good choice. If you have a bean-to-bar company in your city, try checking them out and supporting them. If you love the way the chocolate itself tastes, then you’ll love the final taste of the cake. This cake is decadent, moist, and meant to be shared with others. Perfect for celebrations or special gatherings. Best to enjoy it on the day it’s freshly iced as the ganache will be at its softest and creamiest. However, even on the following day the cake remains tender. Decorate it however you prefer: swirled, smooth, rustic, or topped with chocolate curls or shavings. I love this classic cake, which is why I’ve chosen to share it with you. Spreading the love, one cake a time. Words of advice: Make both the whipped dark chocolate ganache and dark chocolate glaze at least a day before you plan on assembling the cake. They’ll need to cool until they’re firm and it’s just easier to make them the night before (or up to three days before). Also, if possible, bake the cake the day before you assemble it. After it has cooled completely, wrap it securely with plastic wrap and place it in the refrigerator (or leave it at room temperature). Next day, cut and fill the final cake. The cake can even be baked a week beforehand, cooled, wrapped securely in plastic wrap, then placed in the freezer. Remove the cake a few hours before assembling and let it thaw to room temperature. Voila! It’s ready to cut and fill. You will also need 8″ cardboard cake rounds for this cake. These can be purchased at a local craft store, supermarket, or any place that sells simple cake supplies. In a bowl, whisk together the cake flour, baking soda, kosher salt, and cocoa powder. In a separate bowl, whisk together the buttermilk, hot water, and vanilla extract. In the bowl of a stand-mixer, with a paddle attachment, mix the butter until soft and smooth. Add in both sugars and mix, on medium speed, until light and fluffy (about 5 minutes). Stop mixer half-way through and scrape down the sides and bottom of the bowl, then resume. On medium-low speed, slowly stream in the lightly beaten eggs. Stop the mixer and scrape down the sides and bottom of the bowl. Return to medium speed and mix until light and fluffy (about 1 minute). Next, alternate adding the dry and wet ingredients. On low speed, add in one-third of the dry ingredients until just combined. Next, add one-half of the wet ingredients until just combined. Repeat the process until the last one-third of the dry ingredients has been incorporated. Scrape down the sides and bottom of the bowl, mix for another 10-20 seconds to fully incorporate the batter. As with all cakes, try not to over-mix or it will produce a denser cake. Pour out the batter into the prepared cake pan. Bake at 350F for 60-65 minutes. Check for doneness by inserting a toothpick in the center of the cake. It should come out clean (no wet batter) and the sides of the cake will have pulled away slightly from the pan. Place on a cooling wrack and let cool for 10 minutes. Gently invert the cake onto the cooling rack and remove the pan. Remove the round of parchment from the bottom of the cake and allow it to cool upside down. Once completely cooled, place an 8″ cake round on the bottom of the cake and gently flip it right-side up. If not using the cake that same day, wrap it securely in plastic wrap. If using the next day, place it in the refrigerator overnight or in the freezer if using later in the week. When ready to use, pull the cake out and allow it to come to room temperature. *If you’d like to skip the process of cutting out cakes layers from a single cake, prepare three separate 8″ round cake pans. Divide the batter evenly between all three and bake for 18-20 minutes, until a toothpick inserted in the center comes out clean. Let cool, then fill and ice using the same process below. Set out two 8″ cake rounds and a rotating cake stand. Place a small slip-resistance pad or a dollop of firm ganache on the center of the rotating cake stand. This will prevent the cake from moving. If not using a cake stand, place the cake on a cooling rack or a flat surface. Filling the cake layers: Scoop half of the prepared whipped dark chocolate ganache onto the center of the bottom layer. 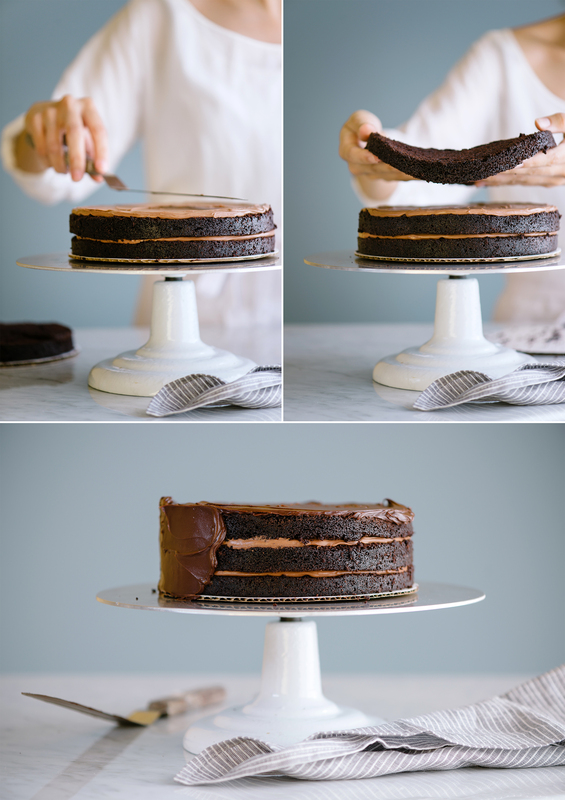 With an offset spatula, evenly spread the ganache from the center of the cake to the outer edges. Slowly rotate the cake stand to help guide the icing around the edges. Carefully, scoop up the second cake layer and gently rest it on top of the ganache. Repeat the filling process with the last half of ganache. Gently place on the top layer of cake. Icing the cake: Gently stir the dark chocolate glaze to loosen it up. Scoop a large dollop of glaze on top of the cake. With an offset spatula, evenly smooth the glaze across the top and to the outer edges of the cake (you want a little overhang). Next, place a small dollop of glaze onto the side of the cake. Smooth it out, working from the bottom to the top. Repeat all around the sides of the cake until completely covered. Clean off the offset spatula and run it around the sides for a final smoothing. You want a thin coating of glaze (or it’ll be too thick when eating), so use it lightly. At this point, continue to decorate it however you would like. Swirl it, smooth it out even more, swipe rustic ridges onto it, and top it with chocolate curls, fresh cut berries, decorative cake flags, or candles. Place finished cake on a cake stand and cut to serve. Cake is best enjoyed on the day it’s assembled as the glaze will be at its softest and creamiest. However, the cake can be stored in an airtight cake dome, or cover lightly with plastic wrap, for up to three days. In a small pot, bring the heavy cream and salt to a simmer. Pour over the melted chocolate and stir until combined. Allow the ganache to cool completely, then cover and place in the refrigerator overnight (or at least 4 hours until it is cold and very firm). 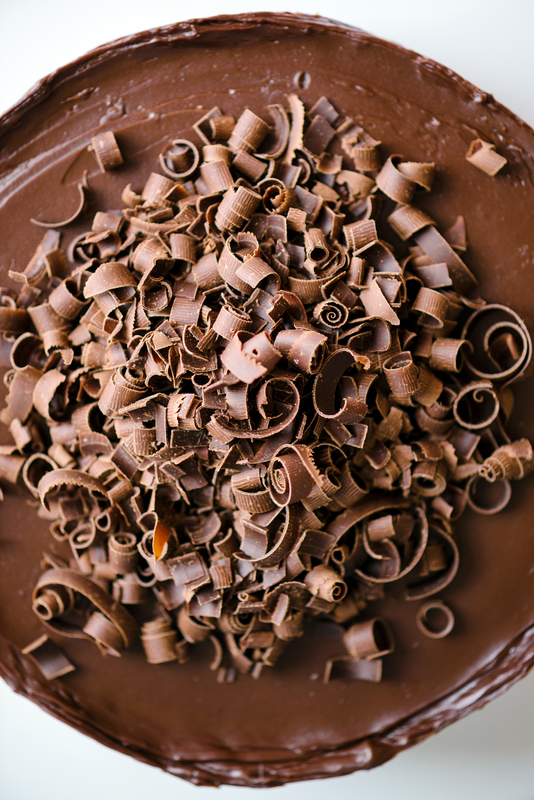 Ganache can be made up to three days before it is needed. When the cake layers have been cut and are ready to fill, prepare the whipped ganache. Using a stand-mixer or a hand-held mixer, whisk the ganache until it holds a medium-stiff peak. Don’t whisk too stiff or it will not spread smoothly. Combine the chocolate, butter, honey, and salt in a bowl and melt over a double-boiler. ** If preferred, combine the chocolate, butter, and salt in a microwave-safe bowl and heat for 1 minute. Stir and reheat in 15-second to 30-second increments until melted, then stir in the honey. Do not overheat or it’ll burn the chocolate. Let the chocolate cool, at room temperature, then cover and let set overnight. Glaze can be made up to three days before it is needed. **Double-boiler: A bowl placed snuggly over a pot of simmering water. The bowl does not touch the water, but instead creates a seal that traps the steam. This steam gently heats the contents of the bowl. Recipes adapted from Alice Medrich’s Bittersweet. Hi, Sophie! Thank you for stopping by to leave such a sweet comment. This cake is favorite of mine, so it was made with a little extra love. Can I also just say how much I love The Green Life? Everything you design is beautifully captured and thoughtfully created. Always enjoy visiting your lovely space. Hope you are well and having a wonderful weekend! Hi! This cake is beautiful and looks SO delicious! Congrats! I want to make it this weekend, but I have a question. For the Dark Chocolate Glaze/Ganache that covers the cake you only use chocolate, butter, honey and salt. I’ve never heard of a ganache like this before, without any heavy cream or milk. Is that ok? Does it have a good flavour with this cake? Isn’t it too much butter for the chocolate? I will appreciate very much your help! Hi Alessandra! Thank you for the kind compliments and the great question. The dark chocolate glaze is not a ganache (hence, no cream) and is meant to be a thin coating of silky smooth chocolate that seals in the moisture of the cake. I’ve updated the glaze portion of the recipe to be clearer (for some reason I had continued to write the word “ganache” in the glaze section- thanks for the typo catch!) and hope this explanation helps. The glaze has a very silky and creamy texture and rich chocolate flavor. As recommended in the recipe it’s best to eat the cake the day that it’s assembled for the best texture possible.